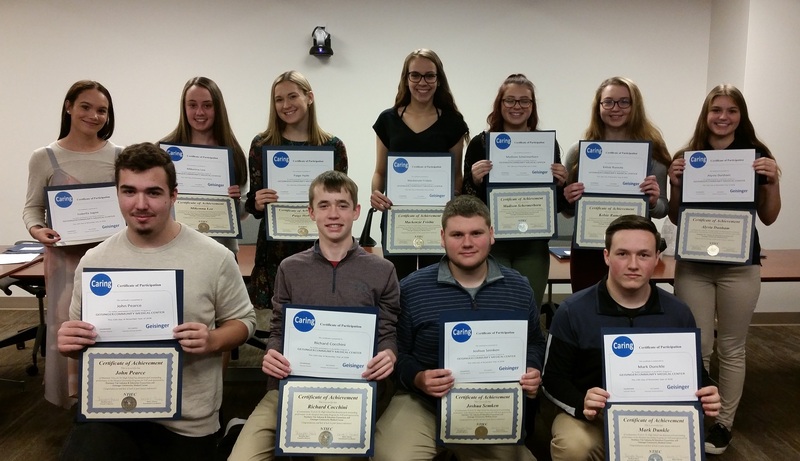 Local student who have served as interns at Endless Mountains Health Systems included (front, from left) John Pearce – Mountain View, Richard Cocchini – Lackawanna Trail, Joshua Semken – LT, Mark Dunckle – LT, (back) Isabella Jagoe – LT, Mikenna Lee – LT, Paige Hyde – LT, Mackenzie Frisbie – MV, Madison Schermerhorn – MV, Kelsie Rumola – MV, Alyvia Dunham – Wyalusing, and (not pictured) Emily Biesecker – MV. Students from Lackawanna Trail, Mountain View, Elk Lake, Montrose and Wyalusing recently participated in multi-week hospital internships set up by Northern Tier Industry & Education Consortium (NTIEC) at Geisinger Community Medical Center (GCMC) in Scranton and Endless Mountains Health Systems (EMHS) in Montrose. “Our program is designed to expose students to the various healthcare career options available to them in our area,” stated Deb Tierney, NTIEC Educational Coordinator. NTIEC hosts a variety of career programs for area students throughout the year. For more information on our programs please reach out to Deb Tierney at 570-278-5038 or via e-mail at dtierney@ntiec.com.